Selecting the perfect office space is a balancing act: customization versus flexibility, independence versus support, accessibility versus affordability. Small businesses will want to find their Goldilocks space; that is, somewhere not too expensive but not too stark, either. Somewhere that’s not too big but still able to accommodate inevitable growth. Shared office spaces are ideal for emerging businesses because their customizable options allows you to save on initial expenses without sacrificing the resources your organization needs. Large downtown shell spaces may seem suitable to hungry eyes, but high up-front costs for barebone space can leave your organization financially vulnerable and ill-equipped to get started on actual work. Executive offices in a shared space come pre-furnished, pre-equipped with industry-leading office infrastructure and include a client-oriented staff ready to handle any and all reception or administrative responsibilities. In addition to escaping the hassle of remodeling floor space and setting up a copier, business centers offer convenient, flexible leases. You don’t have to worry about being on the hook with any long-term liability and payment options can even be customized to accommodate your situation. 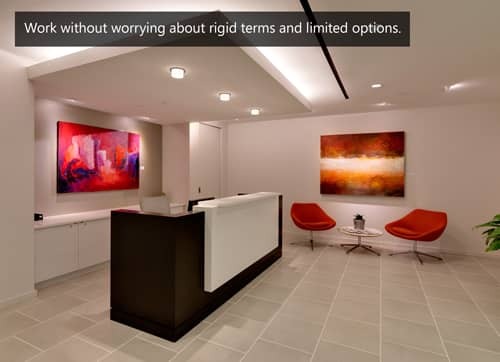 Then, when your business is ready to grow, you have the option to simply upgrade to a larger suite. No expensive movers, no change of address paperwork and, most importantly, no stress. Shared space staff can handle the logistics leaving you free to focus on what matters most, your business. For small and/or startup businesses, shared space offers inexpensive solutions by providing flexible leases and established executive resources already in place. Don’t fall victim to the pitfalls of inconvenient traditional office space, speak with a business center representative today!